The runs on Windows 10 Home Edition. The laptop features a 15.6 inch,TFT LCD Display with HD LED Backlit and is powered by a Intel Core i7,2.8 GHz with Turbo Boost Upto 3.8 GHz processor. To enhance multi-tasking and fast speed, the company has offered a 8 GB DDR4 RAM. Talking about the storage, the laptop uses a 1 TB,5400 (RPM),SATA storage.There is a Bluetooth,Dual Storage,Non-Removable Battery,Retina Display and more.The laptop has a 3 cell battery that will give enough battery life to the users. 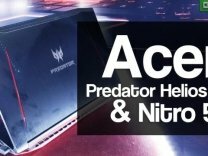 Acer has launched all new Acer Aspire VX 15 Notebook and Predator G1 Desktop for gamers in India. It has also upgraded two of its existing gaming laptops.